We attended our first farmers market of the 2018 season this past Saturday. It was so wonderful hugging our fellow vendors after the long winter apart and of course, getting to chat, high five and hug (there’s always lots of hugging on the first market of the season) our amazing customers. We harvested all day on Friday and we were really happy with the abundance of early season produce we were able to pull out of the ground. Most of what we’re picking is coming from one of our larger hoop houses with the exception of the spring garlic (also known as green garlic) which we harvested out in the field. We were really pleased that we almost sold out of everything except for a few lonely heads of bok choy. I figured since bok choy wasn’t the hottest seller at the market that I’d do something about it. The result was this lovely salad that celebrates the delicate flavors of this spring green. 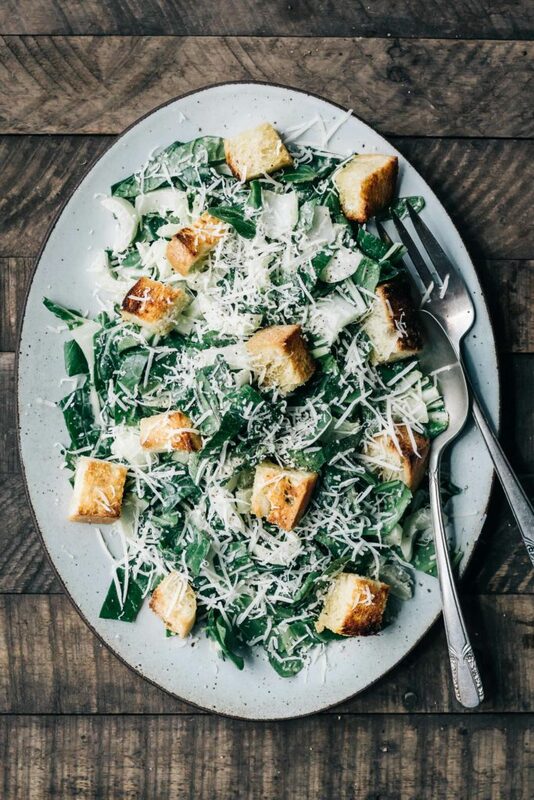 We topped our salad with some garlicky croutons that were made extra delicious because we used the fresh spring garlic instead of cloves. If you can’t get your hands on spring garlic at the farmers market feel free to substitute with cloves instead. Also, in a few weeks we’ll be harvesting garlic scapes and I know those would be equally delicious in this recipe so feel free to make this salad with any and all stages of garlic! I hope you all enjoy this tasty salad as much as we do. I’m hoping it helps move more bok choy at the market next week. Fingers crossed! Preheat the oven to 350F. In a small saucepan melt the butter and oil with the garlic, rosemary and a hefty pinch of salt and pepper over medium low heat. Once melted remove from the heat and let the mixture stand for about 10 minutes. Discard the garlic pieces. In a large bowl toss the bread cubes with the butter mixture and spread them onto a baking sheet. Bake in the oven for about 12-15 minutes or until they are golden. Shake the pan a few times while they bake. Remove individual stems from the heads of bok choy and thoroughly wash them. Pat the bok choy dry and place on a large cutting board. Thinly slice the thick stems leaving the leafy greens whole (set the greens to the side) Once all the stems have been thinly sliced, stack the greens, roll them, and using a sharp knife slice them into thin ribbons. Place the bok choy stems and leaves in a large bowl and add the croutons. In a bowl mash together the minced anchovy fillets and the garlic to form a paste. Drizzle in the vinegar, lemon juice, Worcestershire and mustard and whisk well. Slowly whisk in the olive oil and continue to whisk until the dressing has emulsified. Drizzle the dressing over the salad and toss well until everything is evenly coated. Add the freshly grated parmesan cheese and some freshly ground black pepper. Yummm I’ve been looking for a real ceasar dressing recipe! Thank you!! This is a really good caeser! We made it without the croutons cause we were getting hangry, and at the very first bite, my husband said “mmm, this is really good”. Thanks Andrea! !